Browse: Home / remediation – Tools and utilities for remediation and incident-response handling. remediation – Tools and utilities for remediation and incident-response handling. remediation is a Tools and utilities for remediation and incident-response handling. 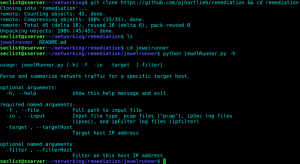 + Parse ipSec (AIX) logs and generate firewall rules. + I have tried to include references wherever I borrowed from others. If I have missed someone, it was unintentional, lest I incur the wrath of the squirrel man. + In retrospect I should have done this in Bro-Script. This is on my list. I’d also like to try using scapy to create and deploy the rules in real time as packets are read. + This code is in-efficient. Several functions are repeated in each module. Future work includes plans for the creation of a utility module to consolidate these functions. + The higher port is always assumed to be the initiator of the connection. This may not always be the case. 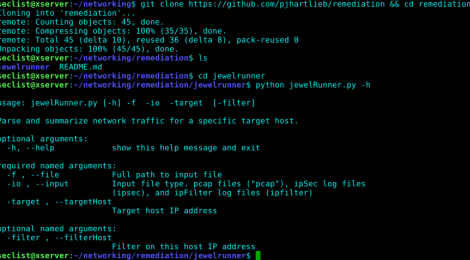 + JewelRunner will not create rules for high-port (>50000) to high-port traffic. However, it will report these flows in the output. 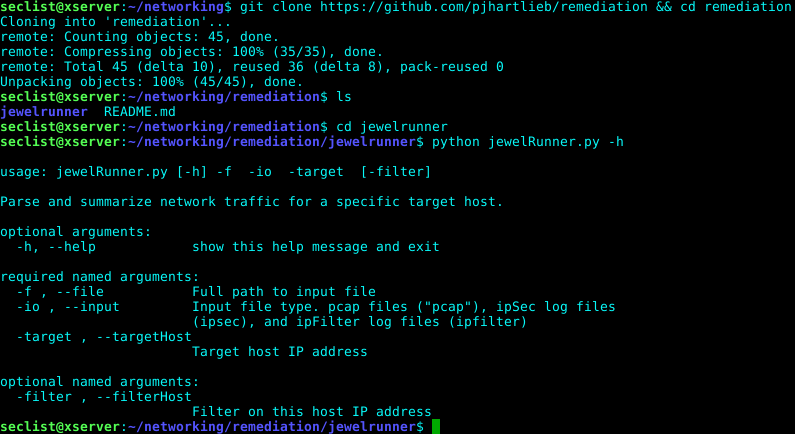 + JewelRunner will not create rules for low-port (< 1023) to low-port traffic. However, it will report these flows in the output. + When an filter IP is specified, jewelRunner makes no assumptions about the source port (ie. > 1023) when creating the host-based firewall rules. Rules will be created using the source port specified in the log file. It is up to the user to generalize these rules later on. + JewelRunner assumes that any traffic it sees is allowed. Any rules should be ultimately adjudicated by the application and product teams. ← idsEventGenerator – Intrusion Detection Systems Event Generator.